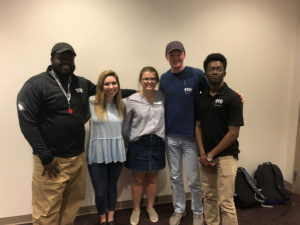 The Collaborative Greek Alliance held its first-ever event, “What It Means to Be Greek,” where individuals from different councils answered questions about Greek life. The event was created by the Collaborative Greek Alliance (CGA) in hopes of forming relationships between students among the various Greek organizations. TCU has five Greek councils: the Independent Greek Council, the Interfraternity Council, Multicultural Greek Council, the National Pan-Hellenic Council and the Panhellenic Council. Each individual speaking on the panel was part of one of these organizations. “Being Greek is all about creating a long-lasting community,” said Victor Norris, a junior and head of community service for the National Pan-Hellenic Council. Even though Greek life makes up 51 percent of the TCU population, CGA recognizes that minority representation is an issue in the Greek life system. CGA panelists Victor Norris, Brooke Morrissy, Greyson McDonald, Ellen Andrews, and Cameron Law answered questions about Greek life at TCU. When asked what she would do to improve Greek life at TCU, Brooke Morrissy, senior and president of Sigma Phi Lambda, said she would alter the way people view each chapter. “It might start by just forming new relationships and supporting each other, whether it’s at events, recruitment or community service,” said Cameron Law, a sophomore business information systems major and president of the Multicultural Greek Council and Omega Delta Phi. The members of CGA hope to have more events like this one in the future. They want to make it a part of the TCU Greek culture and encourage the councils to form relationships with one another and within TCU community. Mackinley is a strategic communication major minoring in journalism at TCU. She has a passion for traveling and trying new foods and has visited many countries all over the world. She loves to explore Fort Worth, binge an occasional Netflix series and spend quality time with her friends and family.